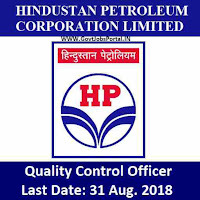 HPCL Recruitment for Quality Control Officer posts in various HPCL offices in India. HPCL is well known as HP Company in India, it deals with Refining, Marketing, Retail, Direct Sales, LPG, Aviation, Operations and Distribution, Projects & Pipeline Group, LNG and other services all over India. Last year in 2017 HPCL achieved net profit of 6,375 Crore on standalone basis. HPCL Recruitment department invites all talented and inspired candidates who are looking for thrilling career openings through this HP Recruitment process 2018. Talented and qualified aspirants can apply for the following HPCL vacancies ONLINE. More information related to these Government jobs under HPCL is given below in this article. Read the whole article carefully before applying this HPCL Recruitment process 2018. We personally took this information from the official website of HPCL, they published a notification their and we took information from that pdf file. We also share the reference link below in this article. Pay Band: Rs.60,000 – Rs.180,000 per Month. Stationary Lab (Job responsibilities will include but not limited to): Officer shall have to perform various scientific analysis as per prevalent national/international standards to evaluate the quality of Petroleum raw materials, in-process materials, and finished goods and ensure compliance to the established standards in a Quality Control Lab. Officer also would be required to maintain the Laboratory’s Quality System, handle laboratory administrative duties, carry out activities in petroleum QC laboratories and also required to promote good customer relation. Mobile Lab (Job responsibilities will include but not limited to): Officer shall have to carry out fuel quality checks of Petroleum products in line with national/international standards and required to operate Mobile Laboratories. These mobile laboratories are equipped with various portable analyser’s and are required to travel across various states. The mobile lab officers are required to carry out onsite analysis of petroleum products. Education: All Indian candidates who have a Master degree under MSc Link under following Subjects : “Analytical/Physical/Organic/Inorganic” can apply for these Government jobs in India 2018. Age Bond: All applicants whose age is less than 30 years on 30th Aug. 2018 can apply for this HP Recruitment process. Paying Method: Those who are eligible for applying can pay the examination fee through the SBI Challan. Visit to the SBI bank near by you with a challan copy for paying the application fee. HPCL Recruitment department is inviting ONLINE application for this recruitment process. Candidates have to follow the Official website for online application. 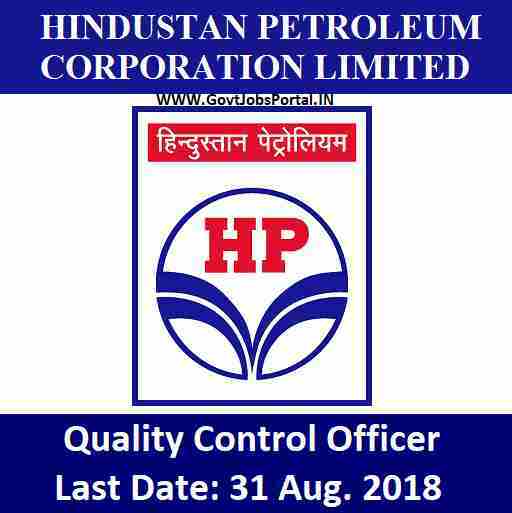 The process for applying online for this HPCL Recruitment 2018 will be activated on 31st July 2018 and will deactivated on 31st Aug. 2018. So candidates needs to apply in between these dates. Under IMPORTANT LINK section we share the official links related to this recruitment process. 31ST July 2018 is the Starting Date for Applying. 31st Aug. 2018 is the Last Date for applying online.